When can a vehicle be made an artifact creature? 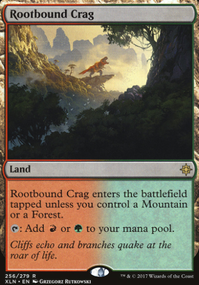 lagotripha on Mono-Green Mining Modern! 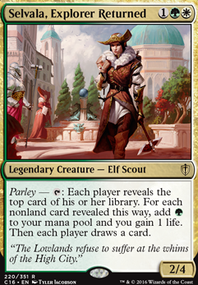 @sea monkey The trinisphere, vivien and ballista serve a really specific role in making this deck tick, and they are what makes the deck expensive. 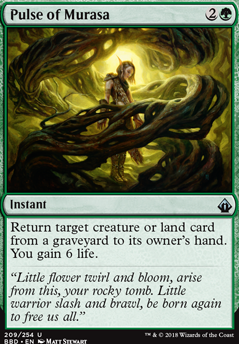 For a more budget list, I'd look at Beast Within , Rootgrapple , Dungrove Elder / Heartwood Storyteller , with Reach of Branches , so that you have creatures consistantly beefy enough to slow the ground game, then sideboard aggressively against burn/aggro with Pulse of Murasa . Eternal witness/Primal Command /plow under is really, really strong together, so I wouldn't look at replacing that. I would love to explain these cards and their function, in this specific 75. Also, thank you for your support and question. In this 60, life-loss can become a minor issue with Bitterblossom . However, Pulse of Murasa in tandem with Collective Brutality mitigates that really well. Not only does it serve as life gain and the obvious Snapcaster Mage retrieval, but may also help to ensure land drops. 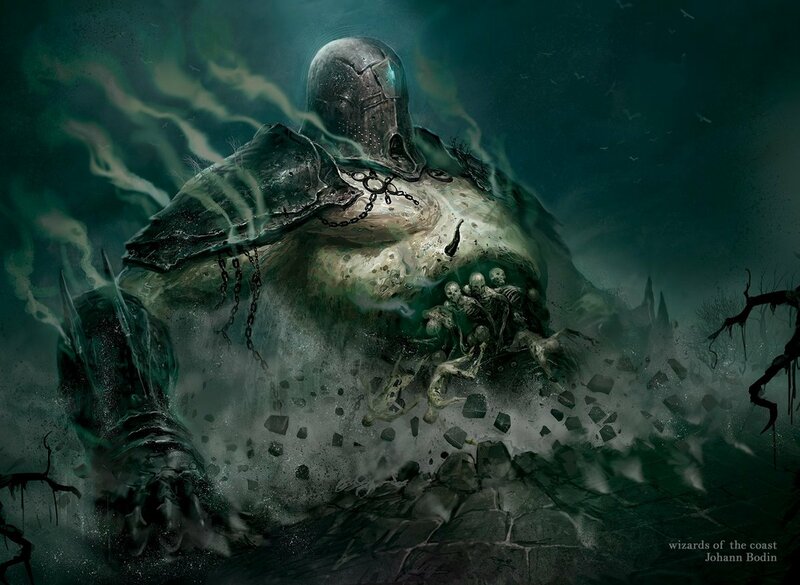 On the other hand, it also serves a more important roll, returning a removed Creeping Tar Pit (Land) to enable the unblockable "One Punch" with Vraska, Golgari Queen 's emblem. In this shell, it serves as a smooth, instant 2 for 1. It also gives the deck more Snapcaster Mage 's to play with, in essence. Hieroglyphic Illumination is a card I was incredibly skeptical about at first glance. However, with testing, this card has earned my respect. It does not have a Scry attached to it, but it may evade being countered due to Cycling not being a "Cast." This also helps against Chalice of the Void , at 1x, as Cycling once again cannot be countered. The ability of this card being a late game "Draw 2x Cards", seriously adds gas to the game. 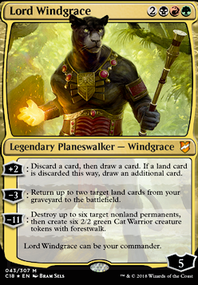 It does not NEED to be cast at 4 cmc, but the option to EOT - draw 2x - is very valuable. Hopefully these answers give clarity to the options I deemed acceptable in this creative brew. Of course 2x Serum Visions would not be horrible though. Thank you for your question. Why Hieroglyphic Illumination and Pulse of Murasa ? Forgive me but those cards seem terrible. I decided to buy some upgrades for the cube. 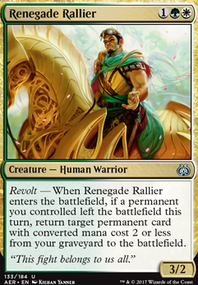 Reanimate is now making its appearance and replacing Thrilling Encore , which was a fun card, but a little confusing and nowhere near as iconic. Gravedigger has been moved to the common rarity, replacing Macabre Waltz . Replacing Gravedigger in the uncommon slot, is Plague Mare . the problem with putting cards like Groundskeeper and Pulse of Murasa in just to enable foil means that you are taking up slots in your 75 just enable on card in the deck if Groundskeeper and Pulse of Murasa have other synergies in the deck the it could work. 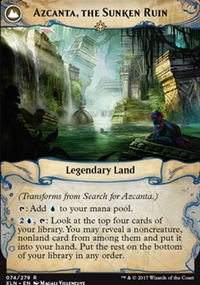 the issue is that off the top of my head I can't think of any cards that synergies well with basic land been put into the yard at common. Pulse of Murasa is a bit diffrent as that is generally just a good card in certain deck like tron that you mentioned. How about a list of recursion spells to include the likes of Pulse of Murasa, Raise Dead, etc. Would this include "Flashback"? or would that be it's own list like Unearth?